Thirsties is revolutionizing the most widely used cloth diaper in the world. Prefold cloth diapers are popular for their affordability and are the most common diaper supplied by cloth diaper services. Though they don’t share all the bells and whistles as other more modern cloth diapers, they have their definite and permanent place in the industry and they have been proven dependable and economical. However, Thirsties Duo Hemp Prefolds are no ordinary prefold! We’ve solved many of the cons of prefold diapers in our patent-pending design. Ordinary prefolds are bulky and take a long time to dry. When hung to dry, they can become stiff and crunchy. In addition, most prefolds are 8 layers thick in the middle, which makes it difficult to clean all layers of the diaper thoroughly. 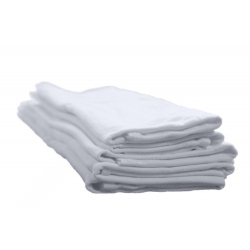 Thirsties Duo Hemp Prefolds are designed to allow air flow and each panel is only 2 layers thick which allows for thorough cleansing with little effort and quick drying times. Our custom hemp jersey is as soft as your favorite t-shirt and it knitted with love right here in the USA. Hemp is an ideal diaper fabric as it displays anti-microbial properties, is many times more durable, and is more absorbent than cotton. In fact, our hemp jersey is 25% more absorbent than a prefold of the same weight made from cotton alone! This translates into a very trim and effective cloth diaper with a hefty amount of absorbing power. We have 3 of each size in stock that are fully prepped.